Showing just how blurry the boundary is between the quantum and classical worlds, physicists in a new study have theoretically demonstrated that a macroscopic oscillating object initially in a classical-like coherent state can exhibit nonclassical behavior—namely, it can violate the classical notion of realism by not having a single definite state at any given moment. Instead, the oscillator has one of two states with a certain probability, as theoretically shown by non-invasive measurements of the oscillator's position at different times. The physicists, S. Bose at University College London; D. Home at the Bose Institute in Kolkata, India; and S. Mal at the S.N. Bose National Center for Basic Science in Kolkata, India, have published a paper on the nonclassicality of a harmonic oscillator's most classical-like state in a recent issue of Physical Review Letters. "Einstein's intriguing and much debated question 'Is the moon there when nobody looks at it?' concerns the everyday notion of macrorealism, which lies at the core of the classical worldview," Home told Phys.org. "To put it simply, macrorealism means that, at any instant, a system is in a definite state having definite properties, irrespective of any observation/measurement. 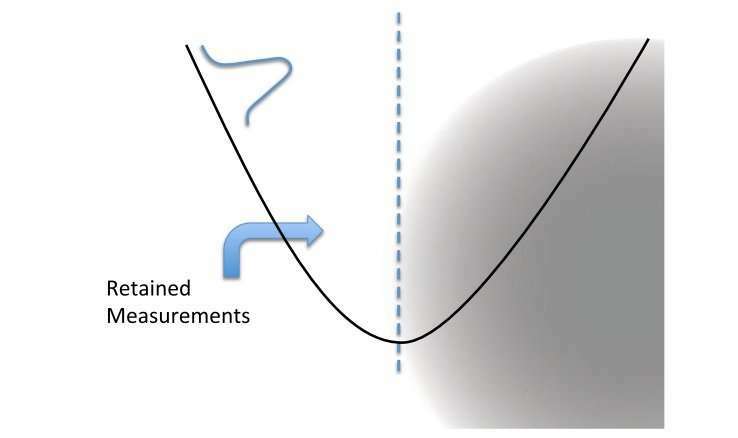 "In this context, our work opens up a novel direction for testing macrorealism by showing that the quantum mechanical violation of macrorealism is testable for a system like a harmonic oscillator, which has a well-defined classical description and is initially in a state which is the most classical-like of all quantum states, the harmonic oscillator coherent state." In their work, the physicists proposed a test involving a linear harmonic oscillator that can be implemented using a macroscopic particle that oscillates between two sides (left and right) of a harmonic well. The two sides of the well correspond to the particle's two possible states. By performing a noninvasive measurement, it's possible to determine which of the two states the particle is in without affecting its future behavior. The researchers then used a test in which a particle's state is measured at two different times in four different runs of the experiment. By making two assumptions—that the particle obeys realism and that the measurements are non-invasive—restrictions can be placed on the possible outcomes of these measurements, giving rise to a testable prediction in the form of a Leggett-Garg inequality. The main result of the study is that, in this example, the quantum mechanical predictions violate the Leggett-Garg inequality even for particles with large mass. This implies that either the particle does not obey realism or that the measurements are invasive. But as the physicists ruled out the latter by proposing to use a measurement procedure called the negative result measurement, which is specifically designed to be noninvasive, the results indicate that the particle does not obey realism, a sign of nonclassical behavior. As the physicists explained, theoretically it's possible for a particle of any mass to violate realism using this test, up to and including large macroscopic objects. The researchers argue that it may be experimentally feasible to use optically trapped nano-objects with masses of a million to a billion times heavier than the hydrogen atom to violate the Leggett-Garg inequality, thereby demonstrating violation of macrorealism for large masses. On the other hand, it should be much easier to experimentally demonstrate the violation for smaller masses since tests with larger masses require experimentally difficult-to-attain values for other parameters, such as the momentum. By the same token, if these other parameters are fixed, then an object may be too large to violate the inequality, indicating a lack of nonclassical behavior. Although there are other methods of testing for nonclassical behavior, the physicists believe that the new test is arguably the simplest method yet. The researchers expect that the test can be implemented using currently available, cutting-edge technology. Already, a group at the University of Southampton has plans to experimentally implement the test in the coming months. "The experimental complexity is seemingly far less than that for competitive matter wave interferometry experiments following the same goal, namely to test the possible macroscopic limits of quantum mechanics and the validity of the notion of macrorealism," Home said. I love it. A hyper-perfect example of 1D fuzzy and 1D straight line simultaneously! Quantum rules! There is no 'classical world', only the classical limit of the quantum world. There is no 'quantum world', only the quantum limit of the classical world. Rovelli's relational QM and Nagarjuna again!